Life at Busy Solitude Farm: Who do you think? I drive to work on a country road surrounded by fields. These days, the plows have left piles of dirty snow all along the road, three or four feet high in most places. This morning I sped along listening to NPR. My concentration was (sadly) on the economic crisis, so my gaze left and right did not focus on anything much. After all, the landscape was just so much dirty snow. Suddenly, as I drove past, one chunk of snow turned its head ever so slightly to follow my movement. A Snowy Owl, aka Great White Owl or Bubo scandiacus! People talk about seeing owls, but I'd never seen one out in a field. It was perched, I didn't see it fly, but it was magnificent in its presence and glorious in its bright white plumage. How I wish I'd had my camera. This photo is the same owl caught by Josh Haas (see his website here). I always wonder how little sparrows and finches keep warm in the dead of winter. The owl appeared to be quite still and comfortable sitting on the banked snow. Peering around, searching for a mouse, pointedly ignoring me. I smiled the rest of the way to work. 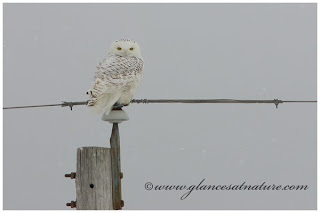 Addendum February 7: Bird-brained friends Charley and Natalie report seeing the snowy owl just across the street from where I saw him -- so he's still in the area! What a wonderful start to the day. What a blessing, just to catch a glimpse! I cannot wait to see a photo of the real thing, or maybe I just need to be more aware of my own surroundings.